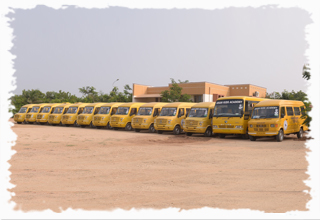 Anan manages a fleet of high quality air conditioned buses that ply from different parts of the city. Every bus has a ‘care taker’ as well as detailed contact information of the parents of students travelling on that route. Our bus routes are also planned in such a way that the student picked up first has a travel time of only 1 hour maximum. Also, learning at Anan starts right from the time students enter their buses where educational videos related to various topics are played.